Whats that? Did I just say new Aussie indie brand. Yep, I sure did. Indie brands are still popping up everywhere, and here in Australia it's no exception. 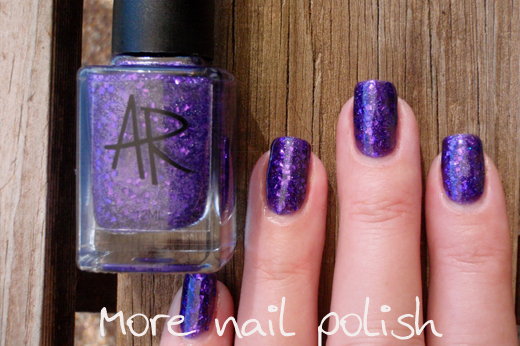 The latest one to hit our finger tips is Alanna Renee, created by fellow blogger Alanna from Pretty Purple Polish. Alanna just launched her nail polish line yesterday, and she sent me five of the ten shades to swatch and review for you. So lets get to them. Purple Addiction - There are no surprises that there is a purple polish like this one in Alanna's first collection, after all Alanna has a bit of a purple addiction herself. 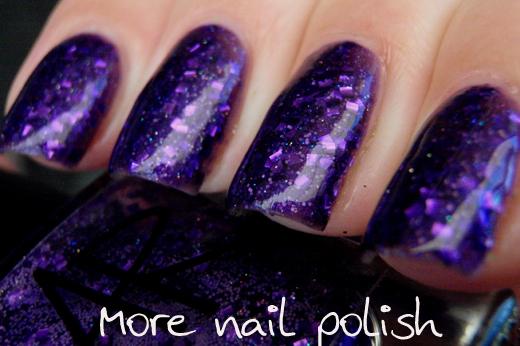 Purple Addiction has a mix of purple square glitter, smaller purple hexes in a shimmery purple jelly base. 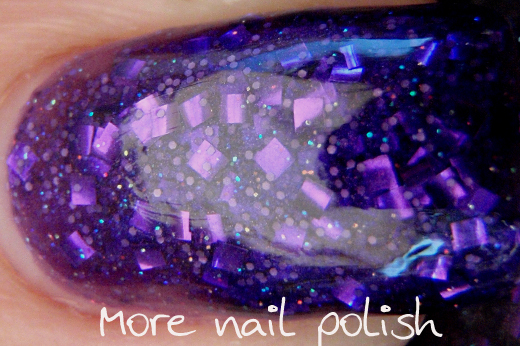 I can also see little flashes of blue and pink micro glitter. The square purple glitters in this have a reflective curl and I did put two coats of top coat on to ensure it was glassy smooth. 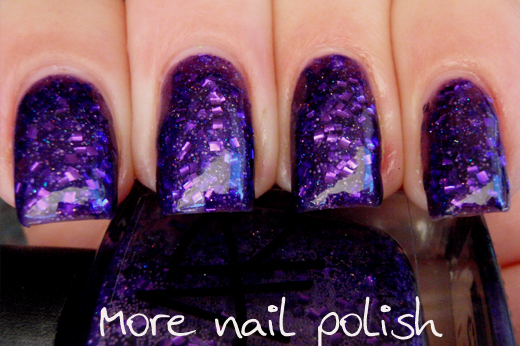 This was two coats of Purple Addiction with two coats of Seche Vite photographed in the shade. Tranquil - a turquoise crelly base with lavender hexes, small light blue and purple hexes and large turquoise squares. Smooth and easier to apply than Purple Addiction. I probably could have done a third coat for these photos, as I can see some slightly bald spots on my pinking, but it's only obvious because these photos are taken in the full sun. Two coats of Tranquil with a coat of Seche Vite. Black Cherry - This one really impressed me, and it's not usually a colour I'd be impressed with as I wouldn't consider myself a vampy lover. What impressed me most was the black cherry base colour. I was expecting it to be streaky like other dark red jelly's out there, but this was just beautiful. The glitters spaced themselves nicely and it wasn't clumpy at all. Black Cherry has a mix of large and small red hexes, large red squares and small black hexes. This is two coats and I left it at that because I really loved the jelly appearance. These photos were taken in the sun, so the jelly base does look a bit lighter and nicely transparent in these photos, but they do accurately reflect what this polish looks like in the sun. In the shade and indoors this looks very dark and you don't really see the small black hexes. 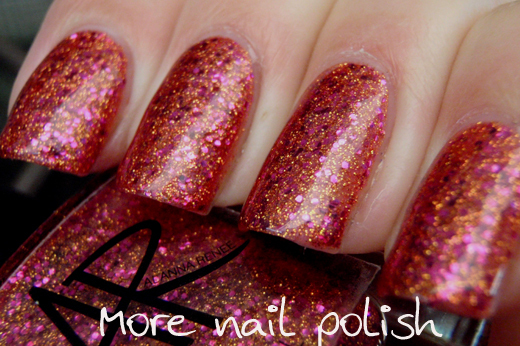 Mardi - pink hexes and small gold micro glitter. In the close up you can see some slight reflective curling on the pink hexes, but these ones were easily covered with one coat of top coat. This one also had good coverage and was opaque with two coats. This is two coats of Mardi and one coat of Seche Vite photographed in the shade. 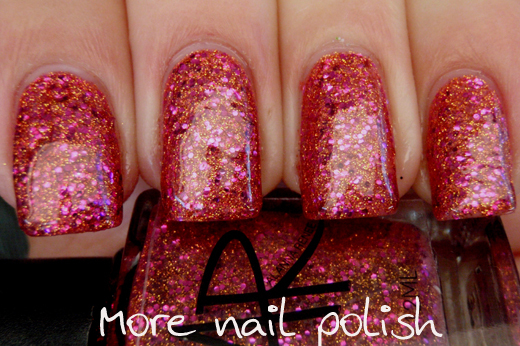 This ones is really pretty, I see what you did there Alanna - adding pink to a gold polish! 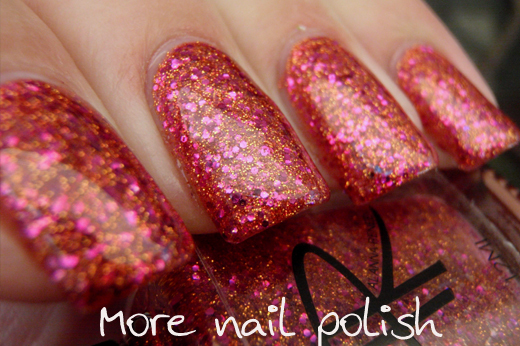 I love gold polish, but don't wear much pink, this is a pinky polish I love! The overall feel is rosy copper. Reptar - This one is quite unique. It has orange and lavender hexes and small black, white and neon green hexes glitter in slightly milky base. 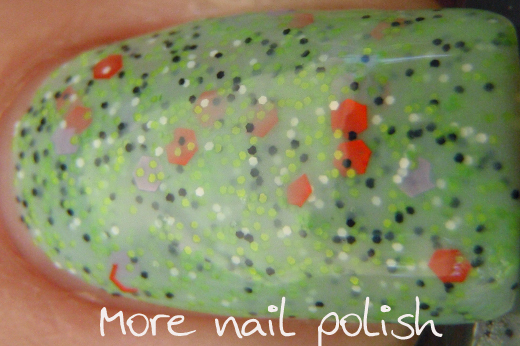 I did two thick coats of top coat to smooth this one out, the small black, white and green glitters make this one a little gritty. 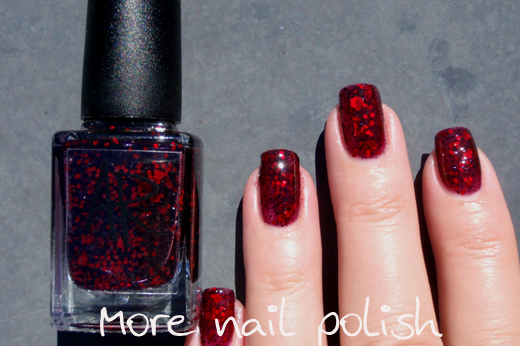 The formula on this one was really easy to apply and was opaque in two coats. The packaging on the Alanna Renee bottles is lovely. 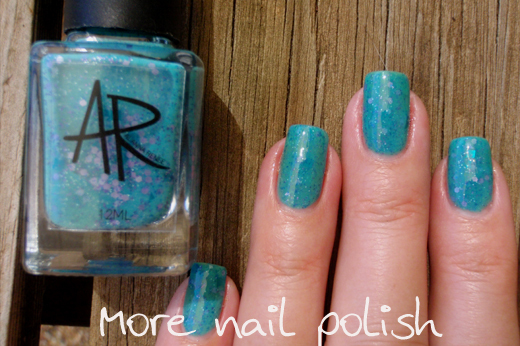 They are in the 12ml square bottles that most of the hand made Aussie Indie polishes uses (think Emily de Molly and Gloss 'n Sparkle) and they have lovely "AR" design clear labels. 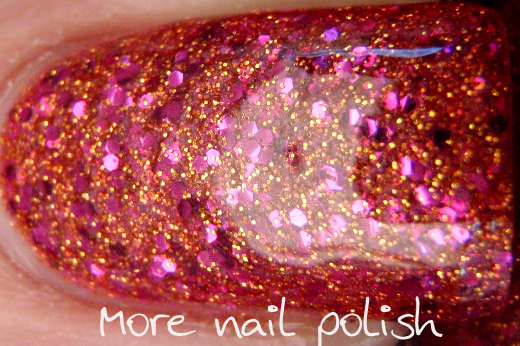 I love clear labels cause it means I can see through into the pretty polish. The underside of every bottle also has a printed square label with the polish name and the ingredients. Very professionally done. 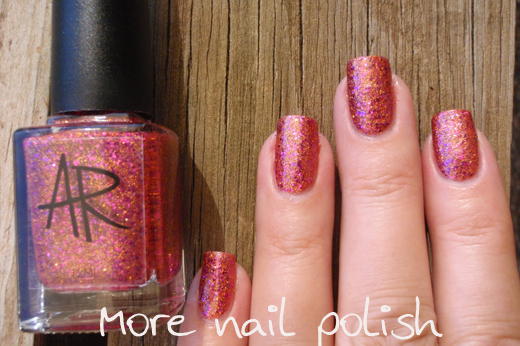 Alanna Renee polish is currently only available in Australia and can be purchased through her shop www.alannarenee.com. The bottles are $7.99 each. International ladies will just have to hold their horses for a while if you like the look of these. But you never know, if enough people love them, maybe some international shops may carry this brand like they do with some of the other Aussie Indies. Thanks for noticing ladies. That's exactly what I was trying to do with the further away photo, show what it looks like in real life a bit better - although sometimes I forget to take the shot like I did with Reptar. 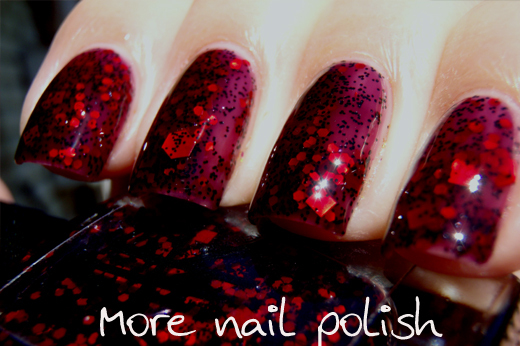 Black Cherry is just my sort of polish, I love it. 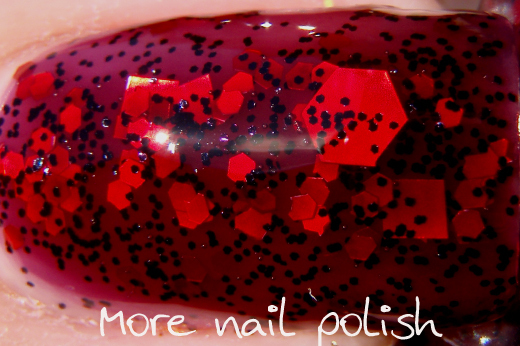 I actually have something very similar on my nails, but not as pretty. I do hope us outside Australia will be able to buy these soon. These are beauties! I wish incould buy them! Whoa! 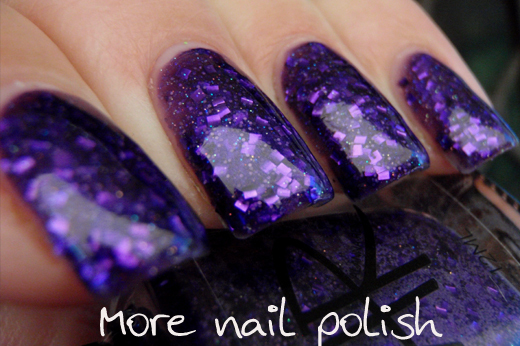 The purple & Turq are stunning shades! I love how the bottles are professional looking as well. 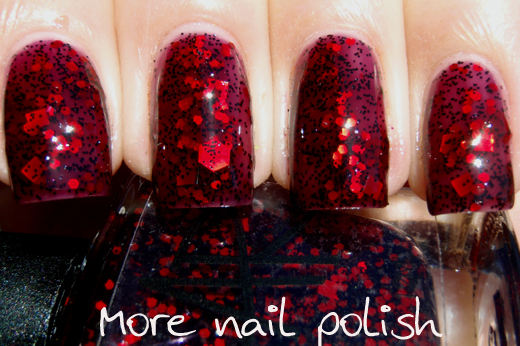 Great swatches Cathy, thanks for your review! I've always liked polishes with a slight reflective curl - it gives them added dimension for me. I know ... I'm not a purest! I just know what I like. Black Cherry is stunning and for some reason I'm really drawn to Reptar. 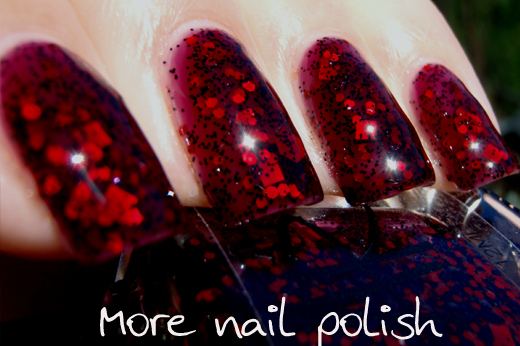 Lovely polishes in all and great swatches to see all their beauty. Great swatches and such unique polishes! What a lovely review. I am friends with Alanna and did all the design work (minus the website) for the new AR label and it's great to hear such positive reviews on Alanna's nail polish and also on my design work. Thanks Again!!! These are gorgeous! I really want Reptar but of course it's already sold out! Definitely going to keep my eye out for when they're back in stock!